The Furies are not chicks you want to mess with. That is partially the moral of this story. The story centers around 4 girls and one male friend. Ambrosia is the ring leader of sorts- she is a lost soul, wandering through time, reawakening the Furies time and again to cause destruction (and hurt a very specific line of descendents). This time, Ambrosia has awoken Alix, Stephanie, and Meg- three girls who have been hurt and who secretly wish for revenge for the wrongs of their lives. This book is not pretty- bad things happen to the people around the Furies, especially if they have wronged the girls in some way. The Furies are not fairies, they are not Disney-fied, they are... well... ugly. They are cruel, angry girls bent on their own form of justice and revenge. Out of the characters, I am not completely sure that I liked any of the characters (except for Meg's friend). I thought they were all not nice, although Meg had glimpses of being a good person. This is important to the plot though, because if they were all sweet, kind, innocent girls- well that doesn't make a good demi-goddess of destruction, does it? All in all Furious was a good book. I enjoyed the mythology surrounding the girls and the history lessons. The end was very fast for me, but I am glad that it ended the way it did. The book was left open for a semi-sequel, so I am curious if that will be happening. 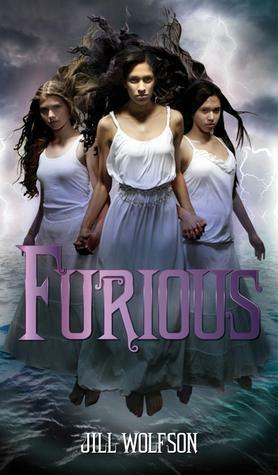 If you are a fan of Greek Mythology- absolutely give Furious a shot. It won't give you a warm gushy feeling, but it was highly entertaining.